In the world of beauty, you can't imagine what brands come up with next! And when it comes to imaginative cosmetics, Dior is no exception. 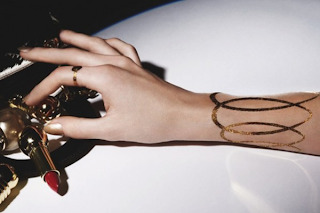 Dior has recently debuted it's first holiday line of 24 karat gold temporary tattoos. The tats are made of real, tiny amounts of 24 karat gold that can be applied for one day only. They are said to blend extremely well with the skin causing it to appear as though it natural.The have offered a variety of designs, mostly holiday themed, and are priced at around $120. I love Dior and all, but this is one product that I can't get into. For that price and for one night only? And I have wash the gold off only to see it go down the drain. Sorry, I think I'll pass.